As part of the Inhabits program at Milan Design Week 2018, the agrAir project by Piuarch outlines the elements which will hopefully be valued for living in the future - lightness, luminosity, careful use of resources, dissolution of contrasts between interiors and outdoors, between natural and artificial spaces – in a balanced relationship between earth and air. 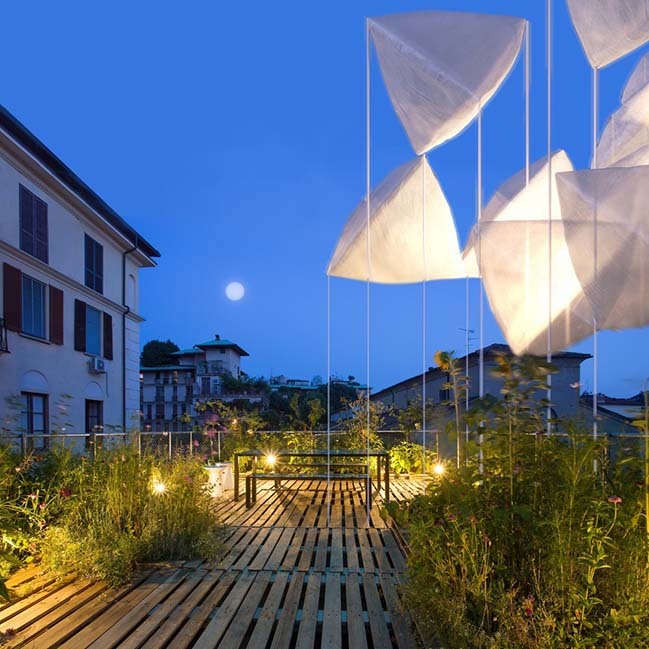 These ideas will also be repeated on the rooftop garden of Piuarch’s office, thus defining a synergic network at Fuorisalone. Two souls and one name to sum them up in a single gesture: agrAir, the installation presented by Piuarch as part of the Inhabits programme of the Milan Design Week 2018, is indeed all about concreteness of the earth, the most ancient cultivation practices, but also about all those intangible actions which together make up the complexity of living. They are not two opposites forced into a delicate balance, but rather two elements harmoniously intertwined to reveal what life in any urban context should look like in the next few decades. What should the optimal conditions for comfort be, both for the public and for individuals? What are the requirements which architecture ought to follow for the purpose of improving the city, of guaranteeing the well-being of its citizens, to encourage social relations and individual accountability with a view to progress in the community? 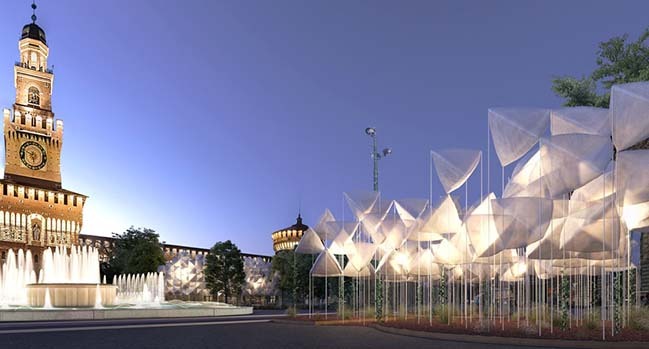 The underlying concept of the Piuarch project, which will also be repeated with the same features on the rooftop garden of the architectural office (via Palermo 1, Brera, Milan) is to outline those values that are able to promote environmental quality through their mutual interaction: lightness, luminosity, careful use of resources and cost-effectiveness, dissolution of contrasts between interiors and outdoors, between natural and artificial spaces, recovery of green areas and agriculture in the city. 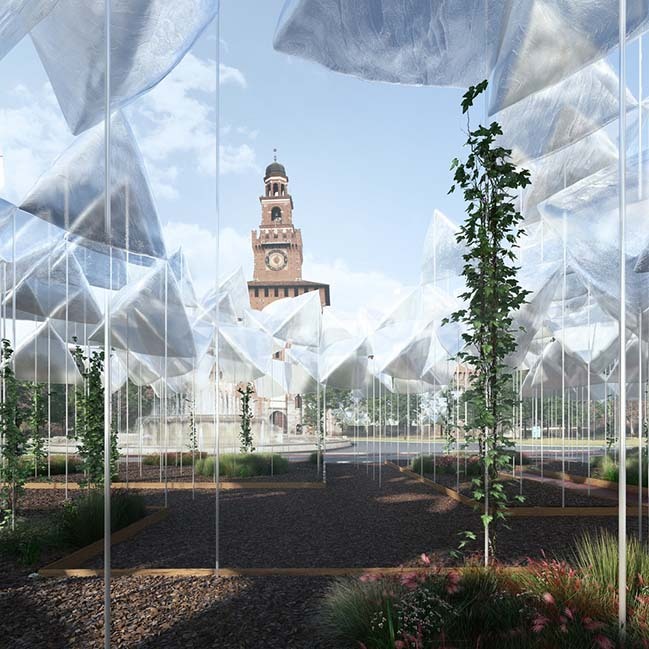 In front of the imposing brickwork mass of Torre del Filarete, in the middle of Piazza Castello, the narration of the main elements has been developed using an installation running along two parallel levels, with continuous connections between them. The lower section, at ground level, consists of a large expanded clay footboard structured onto a 2.1 x 2.1 m square module: it includes two pedestrian crossings and is almost entirely covered by herbs, alternated with graminaceous plants, which follow the basic idea of the module, based on predefined composition patterns drafted by the landscape designer Cornelius Gavril. The image is that of a botanic garden, enriched by colourful flowers and perfumes, to be admired and touched: a fragment aimed at restoring biodiversity and the concept of agriculture in the heart of the city. Parallel to the green basement, a multitude of transparent inflatables dances gently, following the movement of the air. It is a cloud of prism-shaped balloons, made of very soft recyclable film and placed on two different levels, three and six metres high; they are held down by nylon threads and their reflections change colour in the daytime, when the April light enhances the feeling of the first days of spring weather; at night, on the other hand, artificial lighting further accentuates their evanescent character and turns them into fluctuating lanterns. This ethereal composition is a metaphor of a forest, but also of the city itself, an expression of its identity, versatility, luminosity and lightness. Finally, between the two horizontal layers, some connections are drawn: the acrylic glass rods are used as support for creepers reaching to the balloons, marking the indissoluble link between natural items and artefacts. This connection should not have clear-cut margins, but rather offer opportunities for ongoing integration, to improve the conditions of living. agrAir is the conceptual manifesto of a resolved dichotomy; the philosophical depiction of the elements and emotions which architecture needs to be able to bring out. With its set of reflections, gentle movements, lights and shadows, fragrances and colours which the visitors will be able to appreciate by walking along the paths marked on the footboard or from the outside, the installation by Piuarch produces a space with impalpable contours, an urban regeneration programme to promote the celebratory and optimistic approach of Fuorisalone.